Lunch today has very much been a “let’s see what’s in the kitchen” kind of vibe. 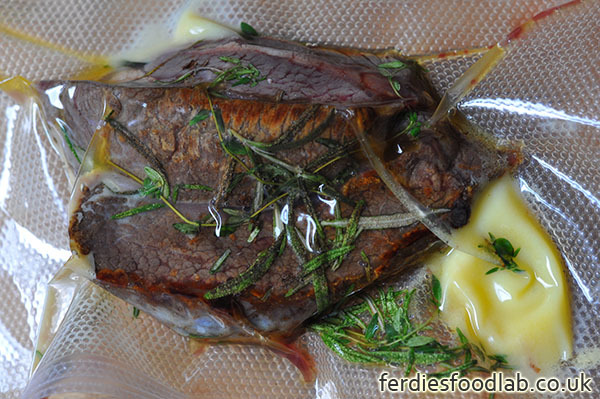 It’s really a test run to see how sous vide ox cheek comes out. I’d normally cook ox cheek slowly for 2 - 3 hours. This breaks down the fat and gristle, into an unctuous gelatine that really contributes to the stickiness of the sauce, and the vegetables and potatoes. That’s a classic and simple way to cook them. For the sous vide test I wanted to keep the cooking process as isolated as possible to understand how the texture is affected, then have some fun experimenting with the accompaniments! Oh and get to use the pea shoots I planted a couple of weeks back : ) will post about that in the next post! 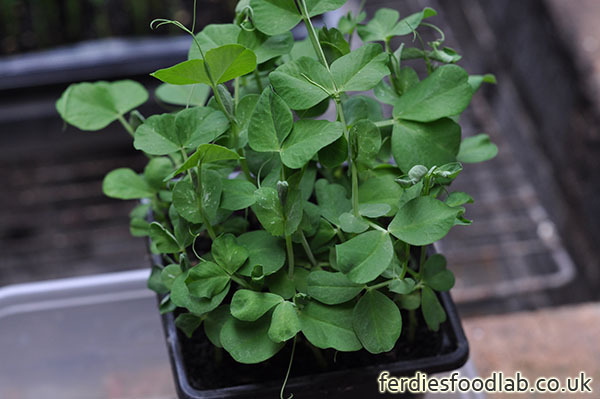 Pea shoots coming along nicely in the garden! (calçots style - Catalonian dish). Hollow palm hearts filled w/ miso creme fraiche puree. Buttered rounds of Afghan sesame bread. 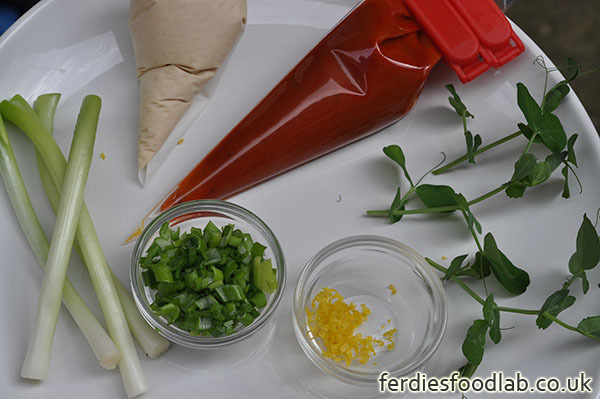 Lemon vinaigrette w/ spring onion. Pea shoots (from the garden). Sear the ox cheek until golden brown. Put all the ingredients into a vac pack or zip lock bag. Sous vide at 80C / 9h. After the ox cheeks cool, put them into the fridge until needed (or use immediately). If they’ve come from the fridge gelatine will have set. Put the bag into hot water ~80C for 15-20mins to bring them up to temperature. Take the cheeks out reserving the stock. Do NOT put the remains of the back directly into the frying pan with the meat the gelatine will quickly reduce and stick to the pan! 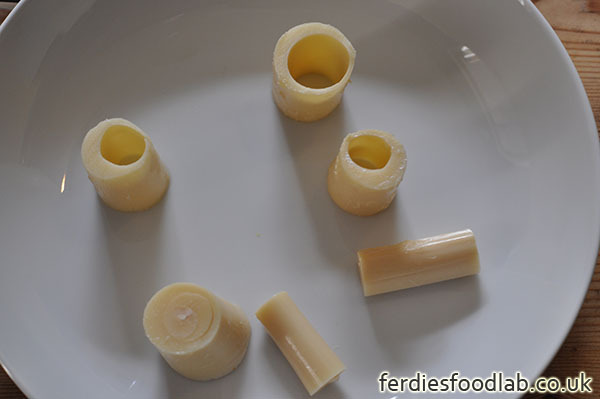 Peel the spring onions and cut the bottom 2/3’s off each. Keep the tips for the vinaigrette. Put stocks into the pot and bring to the boil. Add the spring onions and boil for 2-3mins. Then remove them and put aside for later. 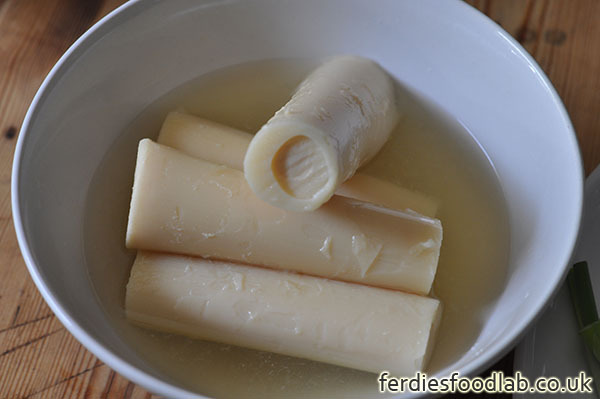 Add the cream and reduce the liquid until it reaches coating consistency. Keep an eye on the saltiness as it reduces! Hang the creme fraiche in muslin over night. Mix the miso & creme fraiche and season with lemon, salt and pepper. It should be sharp as possible without being too loose. Cut the palm hearts into thirds (or halves). 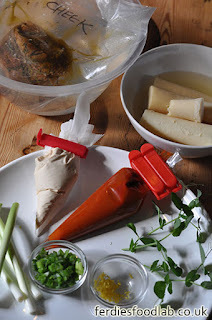 Pop the centres out, these can be used in the miso puree or left as they are. They’re super soft! Fill the hollow palm heart segments with miso puree after they’re plated. Cut the Afghan bread through the middle, toast the sesame side, butter and cut into rounds. Pipe the red pepper puree onto a hot plate. Slice the ox cheek, and place it. 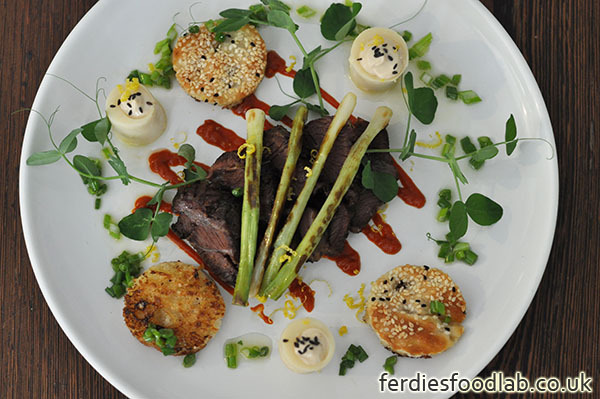 Add the crispy rounds & the seared spring onions, dress with spring onion vinaigrette & lemon zest. 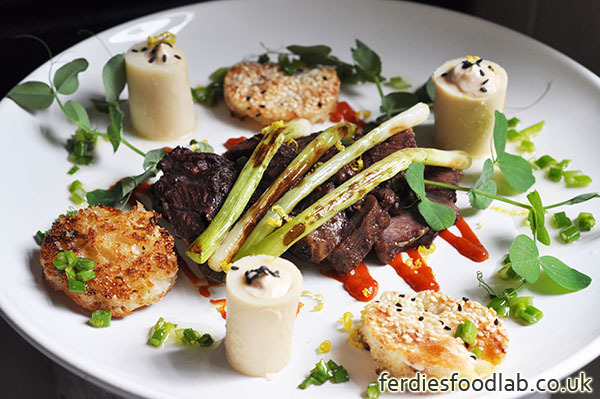 Finally top with ox cheek sauce and serve immediately. The ox cheeks, red pepper puree, miso puree, vinaigrette will all last unto 5 days in the fridge. The ox cheek had a lovely texture and great gelatinous element to it. I chilled them overnight, warmed them through and seared them a touch more. Cracking! For the ox cheek sauce, less is more!! Otherwise it over powers the acidity on the rest of the plate! Maybe lightly pickle the palm hearts for a touch more acidity! SousVide Ox Cheek 75C / 20h - maybe try this time / temp combo next. Recipe: Great night down to our - 5 star guests!